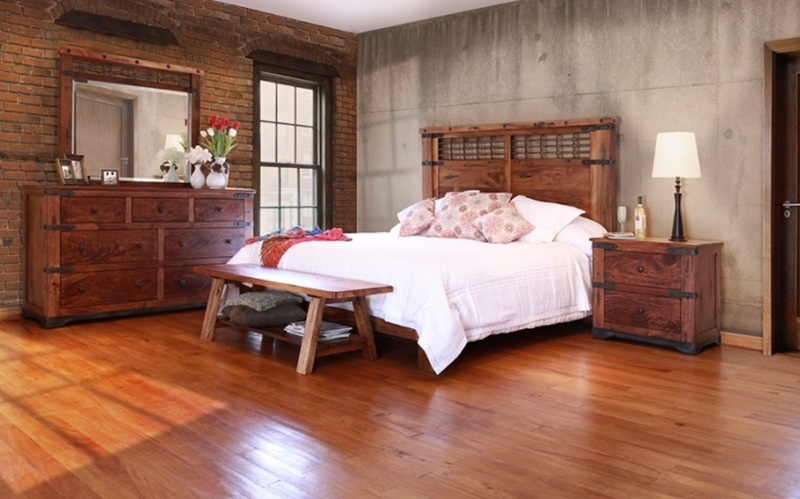 This collection is made of 100% solid hardwood featuring Parota wood, native to Mexico and South America. The metal accents, framing details, and a tall headboard show off the beautiful detail and unique graining. This bed is designed to be used with or without a Box Spring and includes 11 slats for support. Solid wood construction elements on tops include hand carved butterfly joints and lose tongue and groove construction between slabs. Each drawer front consists of solid mango wood and include hand inserted rust finish nails and cast iron pulls. Solid wood drawers feature front English dovetail joinery and ball bearing glides. The top drawers on the Dresser and Nightstand are lined with durable microfiber. Also available in a Dining Group and Buffet Unit!